This adapter is able to config to any kind of ISP adapter. 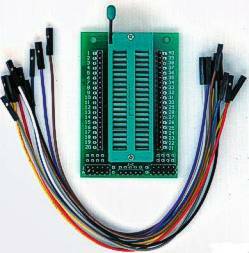 Such as PIC ICSP programmer adapter, AVR JTAG programmer adapter, or ISP programmer. The adapter provids open connection on all pins. So that user is able to use jumper wires to reconfig the connection on each pin. There are three ICSP, JTAG and ISP port on board. Those ports can be soldered as fixed function port. The adapter can be used on Dual power Willem programmer, Enhanced Willem programmer, Ture USB Willem programmer, TOP Programmer, Easy Pro Programmer, Xeltek programmer and all other programmer and experimental system. The adapter set includes jumper wires.